Anna Mary Robertson was born on September 7, 1860, in Greenwich, a small community in upstate New York about thirty miles northwest of Bennington, Vermont. Her father, Russell King Robertson, was a farmer and also operated a flax mill. While Anna Mary's five brothers helped their father at the mill and on the farm, she and her four sisters were taught to master a variety of domestic duties. At the tender age of twelve, Anna Mary went to work as a "hired girl" on a neighboring farm, helping a wealthier family with the household chores. She was to pursue this sort of work for the next fifteen years until, at the age of 27, she met a "hired man," Thomas Salmon Moses, whom she married. The year was 1887, and Thomas had been told that the Reconstruction-era South was a land of opportunity for Yankees such as himself. Within hours of their wedding, the couple was on a train headed for North Carolina, where Thomas had secured a job managing a horse ranch. However, he and his bride never made it beyond Staunton, Virginia. Here they stopped for the night and were persuaded to take over as tenants on a local farm. Anna Mary immediately fell in love with the beautiful Shenandoah Valley--her chilly New York State home (albeit mountainous) would forever after seem a "swamp" by comparison. Life was not always easy, though. Anna Mary, who believed in pulling her weight, bought a cow with her own savings and supplemented the family income by churning butter. Later, when times were tough, she made and sold potato chips. She gave birth to ten children, of whom only five survived infancy. Still, the family prospered, eventually earning enough to buy their own farm. Anna Mary Moses, known by then as "Mother Moses" to many of her neighbors, would happily have spent the rest of her life in Virginia, but Thomas was homesick. In 1905, he persuaded his wife to return North. "I don't think a bit has changed since we left," Anna Mary commented, "the gates are hanging on one hinge since I went away." She and Thomas bought a farm in Eagle Bridge, not far from her birthplace. They named it "Mount Nebo"--prophetically, after the Biblical mountain where Moses disappeared. It was on this farm, in 1927, that Thomas Moses died of a heart attack. Anna Moses was not one to sit idle. Though all her children were now grown, there was still plenty of work to be done on the farm. Later she would joke, "If I didn't start painting, I would have raised chickens." Or, upon further reflection, "I would rent a room in the city some place and give pancake suppers." In 1932, Moses went to Bennington to take care of her daughter Anna, who was suffering from tuberculosis. It was Anna who showed her mother a picture, embroidered in yarn, and challenged her to duplicate it. So Anna Mary Robertson Moses began stitching what she called "worsted" pictures and giving them away to anyone who'd have them. When Moses complained that arthritis made it hard for her to hold a needle, her sister Celestia suggested she paint instead. In this casual manner, the career of Grandma Moses began. Soon Moses had more paintings than she could realistically make use of. She sent some to the Cambridge country fair, along with her canned fruits and jams. "I won a prize for my fruit and jam," she sardonically noted, "but no pictures." Here Moses' painting career might have foundered. For much as she loved art, Anna Mary Robertson Moses was above all a sensible woman, and to pursue art for art's sake alone would, by and by, have come to seem a petty indulgence. But then, in 1936 or '37, Caroline Thomas, the wife of the druggist in the neighboring village of Hoosick Falls, invited Moses to contribute to a women's exchange she was organizing. Moses' paintings sat in the drugstore window, gathering dust next to crafts and other objects created by local homemakers, for several years. Then, during Easter week of 1938, a New York City collector named Louis Caldor chanced through town. Caldor traveled regularly in connection with his job as an engineer for the New York City water department, and he was in the habit of seeking out native artistic "finds." The paintings in the drugstore window caught his eye; he asked to see more and ended up buying the whole lot. He also got the artist's name and address and set off to meet her in person. Moses' family clearly thought Caldor was crazy when he told their Grandma he'd make her famous. And indeed, for the next few years, it seemed the family was right. Caldor brought his trove of Moses paintings to New York City and began doggedly making the rounds of museums and galleries. Even those who admired the work lost interest when they heard the artist's age. Turning 78 in 1938, Moses hardly seemed worth the effort and expense involved in mounting an exhibition; her life expectancy was such that most dealers felt they would never reap a profit on their initial investment. Still, Caldor persisted, and in 1939 he had his first limited success: the collector Sidney Janis selected three Moses paintings for inclusion in a private viewing at the Museum of Modern Art. However, this exhibition, which was open only to Museum members, had no immediate impact. Finally, in 1940, Caldor stopped at the Galerie St. Etienne. Recently founded by Otto Kallir, a Viennese emigré, the Galerie St. Etienne specialized in modern Austrian masters such as Gustav Klimt, Oskar Kokoschka and Egon Schiele. But Kallir, like many of the pioneers who championed modernism in the pivotal decades between the two world wars, was also interested in the work of self-taught painters. In Europe, this trend had been established when Picasso "adopted" the painting toll collector Henri Rousseau, and was furthered by the published writings of the Russian-born Expressionist Vasily Kandinsky. Essentially, these artists and their various followers believed that the work of self-taught artists was purer and more original than that of trained painters. In tandem with a concerted effort to renounce academic tradition, the contemporary avant-garde looked to the example of those who, for whatever reason, had been denied formal training. Anna Mary Robertson Moses made her public debut at the Galerie St. Etienne in October 1940. Otto Kallir had titled the exhibition "What a Farmwife Painted," thinking that the artist's name, completely unknown, did not merit attention. It was only some months later that a journalist, interviewing friends in Eagle Bridge, came upon and then popularized the local nickname "Grandma Moses." The St. Etienne exhibition, though well publicized and well attended, was only a modest success. What really got Moses' career rolling was a Thanksgiving Festival organized by Gimbels Department Store shortly after the St. Etienne show closed. A substantial group of paintings was reassembled at Gimbels, and the artist was invited to come to New York. In her little black hat and lace-collared dress, accompanied by the proprietary Caroline Thomas, Moses (perhaps remembering her experiences at the country fair) delivered a forthright public address on her jams and preserved fruits. The hardboiled New York press corps was delighted, and the legend of Grandma Moses was born. In defiance of every precedent, Grandma Moses became a superstar. She did not do so willfully or suddenly, but she did so nonetheless. Her talk at Gimbels in 1940 brought a burst of publicity, and Moses was soon something of a local celebrity, but her renown was confined to New York State. She exhibited at a number of upstate venues and began to be besieged by vacationers seeking artistic souvenirs. For some years, Moses resisted signing a formal contract with Kallir, believing she could manage matters herself. Finally, in 1944, frustrated by the seasonal nature of her tourist-oriented business and by the difficulty collecting payment from some of her customers, she agreed to be represented exclusively by the Galerie St. Etienne and the American British Art Center, whose director, Ala Story, had also become a steady buyer of Moses' work. The events that established Moses as a national and then international celebrity followed in quick succession. Kallir and Story immediately launched a series of traveling exhibitions that would, over the ensuing two decades, bring Moses' work to more than thirty American states and ten European nations. In 1946, Kallir edited the first monograph on the artist, Grandma Moses: American Primitive, and oversaw the licensing of the first Moses Christmas cards. Both projects proved so successful that the following year the book was reprinted and the greeting card license taken over by Hallmark. In 1949, Moses traveled to Washington to receive a special award from President Truman. The next year, a documentary film on her life, photographed by Erica Anderson, directed by Jerome Hill, and with narration by Archibald MacLeish, was nominated for an Academy Award. Her autobiography, My Life's History, was published in 1952. The dawning age of mass communications gave the public unprecedented access to Grandma Moses and her work. In addition to traveling exhibitions, books and greeting cards, people could enjoy posters and even mural-sized reproductions, china plates, drapery fabrics and a number of other licensed Moses products. By live-remote broadcast--then a technological marvel--Moses' voice was beamed out from her home in Eagle Bridge to the larger world. A rare use of color television was made to show Moses' paintings when she was interviewed by Edward R. Murrow in 1955. Lillian Gish even portrayed the artist in one of the first televised "docu-dramas." The rags-to-riches saga of the elderly painter captured the American imagination. Facing the harsh realities of the Cold-War era, the public took heart in a real-life tale that seemed to prove the old adage, "it's never too late." The media seemingly never tired of repeating Moses' fairy-tale story. In 1953, she was featured on the cover of Time Magazine; in 1960, Life sent noted photographer Cornell Capa to do a cover story on the artist's 100th birthday. That birthday--declared "Grandma Moses Day" by New York's governor, Nelson Rockefeller--was celebrated almost like a holiday in the nation's press. The fanfare was repeated the following year, when Moses turned 101. Everyone rejoiced at the artist's longevity. 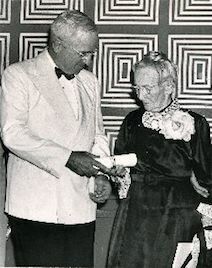 Grandma Moses passed away several months after her 101st birthday, on December 13, 1961. Her death was front page news all over America and throughout much of Europe.